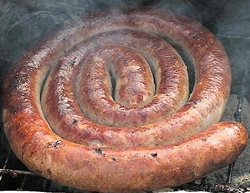 This is all about wors of course, and besides biltong, boerewors has to be the most iconic South African food and I seriously doubt if many South Africans can last for a long period of time without the taste of boerie and washed down with a little lager. Once an almost unknown sausage to the rest of the world boerewors is now international, back in the 80's I was blown over when I found boerewors for sale in the meat department of Harrods in London and then in the 90's I discovered boerewors for sale in the local butchery in a small village in Scotland! Och Aye! Growing up in 50's and right in the middle of that part of South Africa known as the Great Karoo (Also spelt Karroo) the small Karoo town where we lived was surrounded by vast sheep farms which also happened to have large herds of springbok and wild game and subsequently the supply of springbok biltong was always plentiful and here are some memories of those days.